Find out Air New Zealand's baggage restrictions and fees. You don't have to struggle with luggage throughout your journey. Instead, you can use Send My Bag's luggage shipping service. This means you can have many more possessions with you than Air New Zealand's baggage allowance permits, plus you don't have to worry about excess baggage fees. Find out how cost-effective it is to send your luggage with a free quote. Economy: one piece, max. 7 kg/ 15 lbs, plus one personal item. Business Class and Premium Economy: two pieces, max. 14 kg/ 30 lbs in total (no one item may exceed 10 kg/ 22 lbs), plus a personal item. Max. total dimensions: 118 cm/ 46.5 in. What if my Air New Zealand Carry On is Overweight/ Oversized? If your carry-on is deemed to be overweight or oversized, it must be checked into the hold and charges will likely apply (see below). Infant fares on Air New Zealand flights include one piece of carry-on luggage. 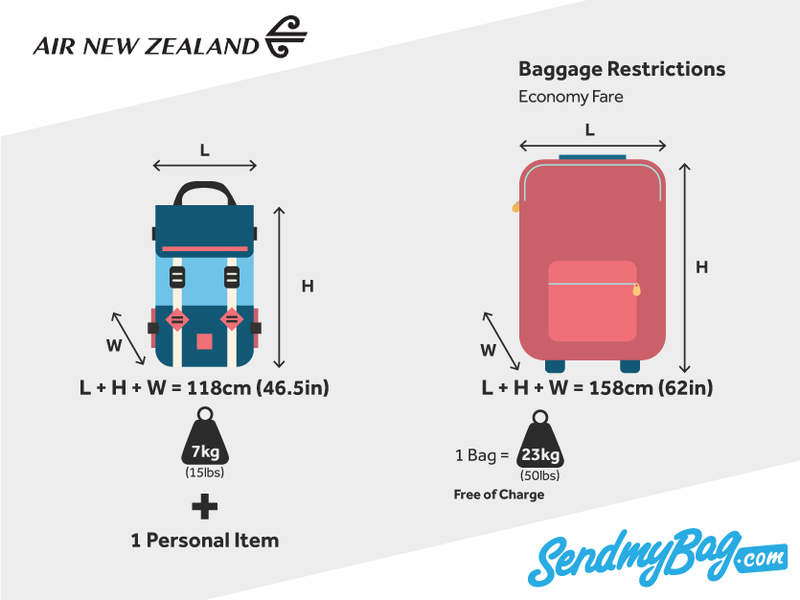 For travel within New Zealand, Seat+Bag, Flexi Time and Smart Saver passengers are permitted to check one piece of luggage that weighs no more than 23 kg (50 lbs) and that has maximum dimensions of 158 cm (62 in), free of charge. Flexi Plus customers are permitted two checked bags. On international flights, Seat+Bag, The Works and Economy passengers have a checked baggage allowance of one 23 kg (50 lbs) / 158 cm (62 in) item, while Works Deluxe and Premium Economy passengers are permitted two checked bags. Business customers have a checked allowance of three bags. Seat-only fares have no baggage allowance. Extra baggage allowances can be purchased from Air New Zealand in advance, with prices dependent on the route travelled. On all domestic New Zealand flights you would expect to pay $35 NZD for the first prepaid bag and $55 for the second. On a flight between New Zealand and London you would pay $165 NZD and $205 NZD to pre-purchase the first and second additional bags. Bags weighing over 23 kg (50 lbs) or exceeding 158 cm (62 in) in total dimensions will incur a charge. The amount charged depends on the passenger’s departure point and destination. For example, if travelling from New Zealand to Australia, the charge would be $120 NZD. No bag may exceed 32 kg (70 lbs). Sporting equipment that measures less than 2 m (6.5 ft) in length and that weighs no more than 23 kg (50 lbs) can be checked into the hold. If an item weighs more than 23 kg but less than 32 kg (70 lbs) (but measures no more than 2.5 m (8.2 ft)) it can be checked, but an excess baggage fee will be charged. Looking for Air New Zealand sized hand luggage?